Raccoons (Procyon lotor) and North America's only marsupial, the Virginia opossum (Didelphis virginiana), occur in various habitats due to their adaptability to find new food sources. This adaptability and opportunistic feeding behavior has earned each the title of "pest." While the creatures are noticeably different, they share many features and preferences. Raccoons range from just under 2 feet long to just over 3 feet long and can weigh up to 23 pounds. Their characteristic tails make up around 50 percent of their total length. Opossums, on the other hand, range from about 14 inches to just over 3 feet, with an average length of about 30 inches. They can weigh up to approximately 13 pounds, making them around the size of a domestic house cat. Both animals have rather stocky builds, although the raccoon has a heavier body set. Raccoons and opossums are nearly unmistakable creatures as both have distinguishing characteristics. Raccoons possess long, bushy tails with black stripes set on a buff-colored background and a black "mask" over their eyes. Opossums, on the other hand, have rat-like, scaly tails and whitish to grayish fur over the rest of their body. In both species, the males are larger than females. Both possess human-like hands that make them capable of grasping a variety of items. Both creatures are scorned for their scavenging behaviors; both commonly forage in trashcans and Dumpsters for meals. Raccoons and opossums both exhibit omnivorous diets, although their preferred meals vary slightly. In the wild, away from human habitation, raccoons feast on a number of invertebrates including many aquatic species. In some parts of their range, raccoons may feed more on fruits and nuts than meat. Opossums feast primarily on insects and carrion, although they'll gladly eat a meal of in-season fruits. Both species prefer to live near water, although raccoons are rarely found away from a dedicated water source. Both raccoons and opossums are highly nocturnal and rarely are seen by humans except as roadkill or digging through the trash at night. 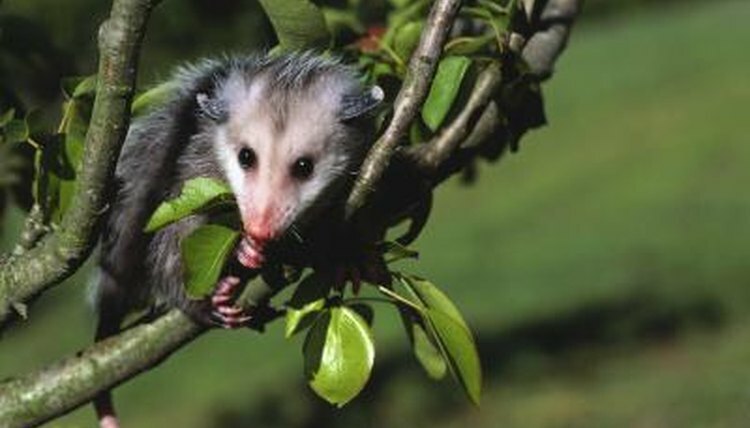 Opossums are found throughout eastern North America, whereas raccoons occur throughout most of the U.S., southern Canada and south to northern South America.